The Boston Towing and Transportation began when the Boston Towboat Company, which began as the T-Wharf Towing Towing Company of Boston, Massachusetts. Which was owned by a parent company called the Mystic Steamship Company of Boston, Massachusetts. The Mystic Steamship Company operated coal carrying colliers, transporting coal to, and from east coast ports such as New York, New York; Baltimore, Maryland; and Newport News, Virginia. However ownership changed hands when the T-Wharf Towing Company was absorbed into the parent company of Boston Gas Eastern Enterprises Incorporated of Boston, Massachusetts. The company was rebranded as the Boston Towboat Company Incorporated of Boston, Massachusetts. The Boston Fuel Transportation Company was founded in 1932 by Bert Reinauer. 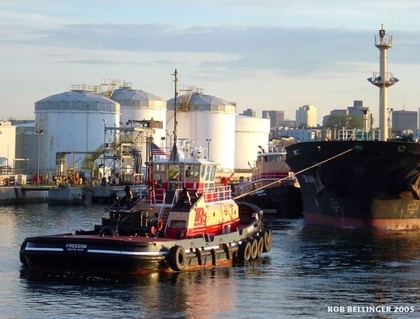 The Boston Fuel Transportation Company operated a small fleet of motor tankers and barges that called on ports in New England. In the early 1950's he partnered with Vincent Tibbetts Sr. Who at the time, owned a company called the Chelsea Fuel Company of East Boston, Massachusetts. In 1979, the Boston Fuel Transportation Company acquired the Ross Towboat Company of Boston, Massachusetts. The acquisition signaled the Boston Fuel Transportation Company's entrance into the ship assist market. In 1985, the Boston Fuel Transportation Company acquired the Boston Towboat Company. This transaction included its yard, its vessels and the company's name. The combined companies formed the Boston Towing and Transportation Companies. Even though the Boston Towing and Transportation Company's tug division was focused on ship assist work. The company continued transporting oil. With three medium sized barges, as well as their tugs. The Boston Towing and Transportation Company serviced various New England ports such as Portsmouth, New Hampshire; Portland, Maine; and Bangor, Maine. In 1990, environmental regulations called for vapor recovery systems to be installed for the transfer of gasoline from shore side to barges. Since the oil terminals in the port of Boston, Massachusetts opted not to install the systems. The majority of the Boston Towing and Transportation Company's barges were transferred to the Reinauer Transportation Company's operations in New York, New York. Where vapor recovery systems were already in place. Meanwhile, the Boston Towing and Transportation Company continued to perform ship assist, and towing services in and around New England; Boston, Massachusetts, and Maine. In 2011, the Boston Towing and Transportation Company was reabsorbed into the Reinauer Transportation Companies of Staten Island, New York. Although, the vessels still feature the Boston Towing and Transportation logo on their stacks. All of the company's assets are wholly owned by the parent company, the Reinauer Transportation Companies of Staten Island, New York.